Nestled in the cove of Jaco Beach, Hotel Club del Mar is located on the Central Pacific coast, just two hours from San Jose. Jaco, once known as a small fishing village, has now become a lively town and tourist destination, especially amongst surfers. Here you can find all the necessities and luxuries of a city yet also find yourself amidst tranquility and peace. Take a day trip to some of the area's pristine beaches or head to a national park such as in Manuel Antonio where you'll walk amongst gorgeous beaches, monkeys, and iguanas. Also try a waterfall canopy tour or sail into the sunset on a catamaran. Here you can make your Costa Rican vacation an unforgettable one. The tropically decorated, "Las Sandalias" is the beachfront restaurant and bar where you can have a sunset dinner or cool off from the mid day sun with an iced drink. 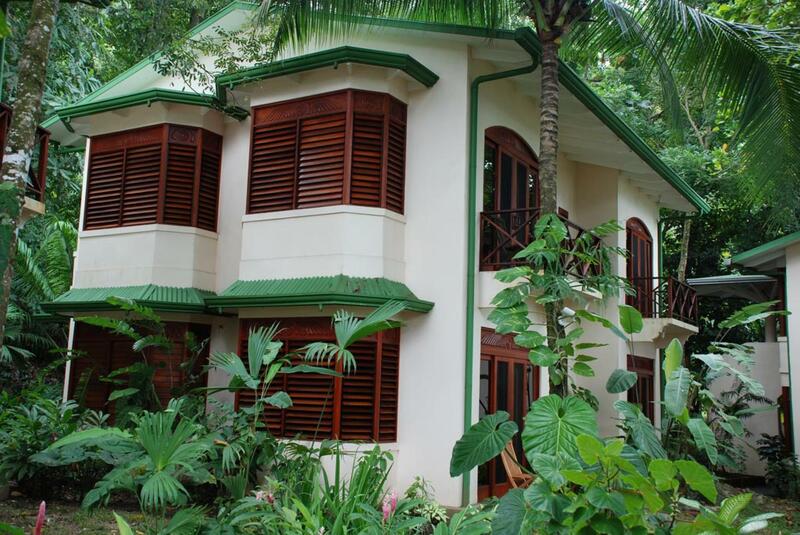 The restaurant offers Costa Rican and international fare and is surrounded by lush gardens. The beachfront property of the hotel provides a safe area for swimming, canoeing, and boogie boarding. There is also a jogging area as well as a social area to enjoy family, friends and other hotel guests. Club del Mar is an intimate hotel offering beautifully furnished and spacious rooms on the south end of Jaco Beach. Accommodations consist of four one-bedroom casitas, eighteen two-bedroom casitas, an eight-room boutique hotel and two penthouse suites. The casitas are built in harmony with the natural tropical surroundings, living up to the concept of indoor/outdoor living. All the casitas have an ocean view, one or two bedrooms, private bathroom, AC, living room, high ceilings and furnishings by award winning interior decorators. "Excellent location, clean, on the beach, and the restaurant was fantastic! " Excellent location, clean, on the beach, and the restaurant was fantastic! This hotel right on Jaco Beach was fantastic for everything - location, rooms, amenities, etc. were all perfect. We preferred this spot right on the beach to anything else - great sunsets, the best beach ever are at Jaco - and it is easy to get into town to explore the local cuisine. We had a nice condo near the beach. Worked our very well for us. Neat to be there for the New Year's eve celebrations and all of the fireworks. Beautiful little gem at the end tip of Jaco. Very friendly staff and owner. Beautiful hotel! It was a little far for us to walk to the main part of the city, but the taxi ride was really nothing. The hotel was great, we were upgraded to a condo. The staff was great! No complaints! Would come here again. Hotel was awesome, innkeeper cooked up the fish we caught. Great surf and friendly staff! Perfect place to stay in Jaco, within a 1 mile walk of the main drag, but being tucked away on the each of the beach makes it the best location their! Food was very good. View was fantastic. Helpful staff. Beautiful hotel, right on the beach great restaurant. The rooms were gorgeous, looked over the ocean and great view of the sunsets. Good location from Jaco itself. Our condo was beautiful. The only complaint I had was the noise of the traffic as the main highway runs in front of the condo. My bedroom faced the highway and could here the trucks air breaks throughout the night. My sister had the back bedroom in the condo and did not have this issue. Otherwise this condo and resort was wonderful. The location was very good. We got a room at the very end and it was very peaceful. The food was better than I would have imagined from a hotel. I like the room setup with the kitchenette and living room area. Bedroom had a good view. The owner was nice and the staff as well. Only complaint we had with this hotel was minor and was remedied quickly. We arranged for lodging for three adults. Our room only had towels for two. Our request for additional supplies was responded to quickly.